I am so sick of Maliki. This parasite has cause so much trouble! I don't understand how they allow him to get away with so much! Why do they even deal with this clown!!! Can Iraq RV their currency...can the Government bank on that!! Now this is the type of information that brightens up my morning stop the auctions and let's get down to business!! Yes Botzwana I am a functioning Adult. Don't attempt to insult people just because they are asking question and don't agree with you everything you post! We are all here for the same reason a positive return on our investment. This is Currency Speculation and only a fool would believe anything one person tell them!! This is Iraq! No one knows the date or the rate so keep the personal comments to yourself. Thanks!! Go Rv!! Right Jakes21 and what about the 76 trillion in dinar the other artilce mentioned..can someone explain that? 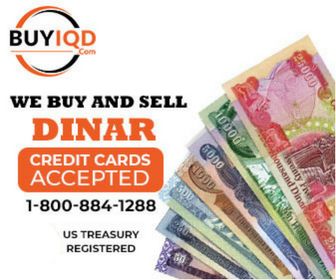 Also, Iraq and Iraq want to trade with the dinar, how can they if it doesnt have value...???? Engine1 So the US Government allowed us to get screwd twice by taking our tax dollars to finance the war and allowed us to buy the worthless currency and Iraq benefits..havent they been pulling some of this currency in over the years through the auctions....what the hell is really going on!! How are they gonna RV with 89 trillion out there...someone please explain.